Microsoft Surface Pro (2017) is a great 2-in-1 device with a lightest and thinnest design ever built by Microsoft. It packs with a powerful 7th Generation of Intel Core processor. This new Surface Pro now has a better performance, longer battery life, better display, improved Surface Pen, new Studio mode, new air vein design, and so much more. We have just recently highlighted our best-picked cases and covers for the new Surface Pro (2017). Today, we gonna introduce another best-picked list of bags, briefcases, and backpacks for protecting your Surface Pro (2017) with a perfect fit and stylish. Fit Surface Book, Surface Laptop, Surface Pro 4, and Surface Pro (2017). 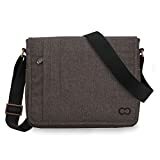 First of the list is the Brenthaven Collins horizontal messenger bag that designed to fit all Surface Pro, Laptop, and Book. It made from high-quality materials, you can feel just how sturdy it is. 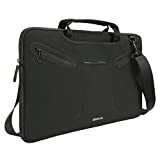 The laptop compartment has a well-padded material to protect your Surface from scratches or bumping around with the other stuff in the main compartment. Inside the main compartment, there is two pockets and room to keep your documents and accessories. On top of that, the outside of the bag also has dedicated pockets for keeping your Surface Pen and Surace charger as well. The next one is the messenger bag from CaseCrown that fit really well with your Surface Pro (2017) or its predecessors. 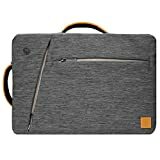 It can keep your Surface Pro (2017) and your tablet secured with its padded room with the elastic band and Velcro closure. Moreover, it also has multiple large and small pockets for storing your documents, phones, pens, chargers and all your necessary stuff. It has a detachable and adjustable shoulder strap with padding easy to carry through your day. With its secure Velcro closure make sure your devices never lost its protection in any accident. This messenger bag available in two orientable horizontal and vertical with a variety of color options. Professional look on a budget. Exterior: Premium soft synthetic leather. Fit Surface Pro 3, Surface Pro 4, and Surface Pro (2017). 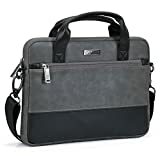 If you want a budget with a professional look, PU Leather briefcase from Evecase is an excellent selection. It made from a high-quality premium material with a slim and compact design. The included detachable shoulder strap is comfortable to get you through a trip to places from home. Composed of shock-absorbing bubble foam padding inside the laptop compartment keep your Surface Pro from bumps or drops. Additional large pocket and metal zippers on the front all make for keeping your chargers, pen, and other stuff secured in place. 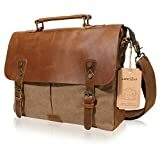 Best flexible messenger bag for business users. Made from 100% Polyester with waterproof TPU liner. Multiple external access zipper pockets. Available in a variety of size and color options. 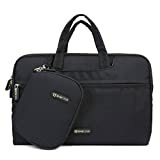 If you looking for great messenger bag while you are on a business trip or holiday, the Timbuk2 Command Laptop Messenger bag is highly recommended. With the TSA-compliant, you can send your bag through security without removing your Surface Pro. Moreover, the Timbuk 2 Command uses aluminum hooks with tensioned elastic attaching to the webbing loops for a secured closure. The polyester material isn’t as eye-catching as leather, however, it’s super durable. It has multiple pockets, rear pockets, and inside organizer pockets. You can put all your Surface Pro, tablets, phones, power bank, and even your sunglass into this bag. Included a theft proof combination lock. Briefcase + Accessory Pouch + Mouse Pad. Included an Evecase mouse pad. Included accessory pouch case attachable to the bag. Compatible with new Surface Pro, Surface Pro 4/3. Is it a shoulder bag, messenger bag, or backpack? Actually, it’s 3 in 1. Hybrid design easy transform into a shoulder bag, messenger bag or backpack. Multiple pockets for keeping your chargers, tablets, phones, documents and so on. Compatible with Surface Pro (2017) and Surface Pro 4. Multifunctional Surface Pro shoulder bag. Padded handle straps easy for carrying. 2 x large pockets, 2 x small zipper pockets, and an ID card pocket. Laptop Bag with Crazy Horse Leather. Exterior: Durable crazy horse leather. High-quality zippers and secure magnetic closure. Available in coffee and gray colors. 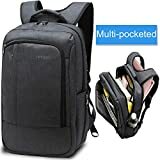 Water Resistant Computer Backpack for Men. Has multiple pockets in the front, back, and inside the main compartment. Available in multiple sizes ranged from 14-inch to 17 inch. 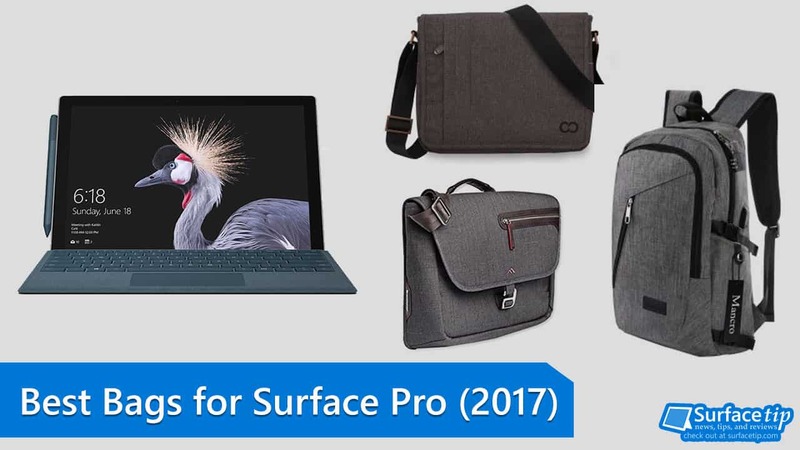 We appreciate hearing your thoughts, questions, and ideas about “Best Bags for the new Surface Pro in 2019”. Please post respectful comments and on topic. We will be replying back to you as soon as possible. Share your idea about "Best Bags for the new Surface Pro in 2019".